In the past couple decades, game designers have been creating fascinating, immersive games that make Monopoly seem like it was designed in 1905. Game night no longer means suffering through hours of rolling dice in Monopoly or Risk. Today’s games cultivate creativity, problem solving, social skills, and dexterity through clever game design. Join Guild Hall and Game Master Noah Salaway in embracing the tabletop revolution as we play some of the best modern games on the market the last Monday of each month. Ages 16 and up only. This month at Guild Hall Game Night we will be playing Sheriff of Nottingham, designed by Sérgio Halaban and André Zatz. Sheriff of Nottingham is a game of bluffing, interrogation, bribery, and, occasionally, telling the truth. Players assume the role of city merchants, with one player acting as the sheriff each round. The merchants each hand the sheriff a bag of goods, declaring what is inside. While the merchants can make a living honestly, it is much more profitable to smuggle contraband in their pouch… if you can convince the sheriff not to look inside. Join us on October 29 at 6pm and try to smuggle some contraband under your friend’s nose. Don’t forget to bring your poker face. Recent graduate of NYU with a degree in game design. 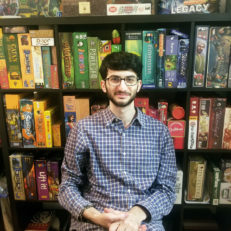 He grew up playing video games, but has recently become obsessed with modern tabletop games. 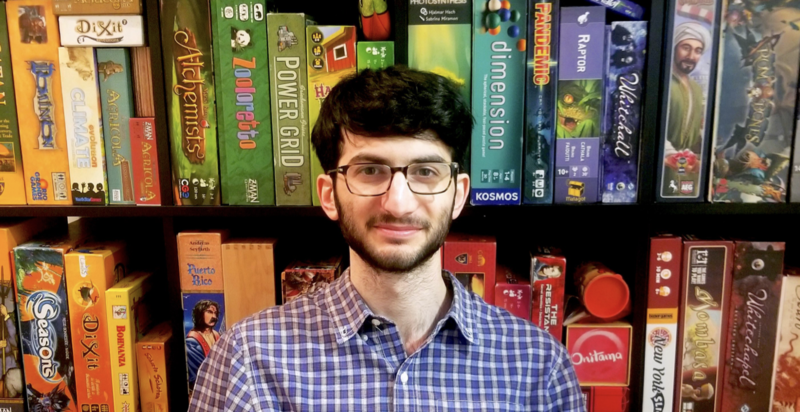 Whenever possible, Noah is either playing, teaching, or researching new board games. Snacks generously donated by Carissa’s Breads and Cavaniola’s Gourmet and your first drink free courtesy of Montauk Brewing Company!